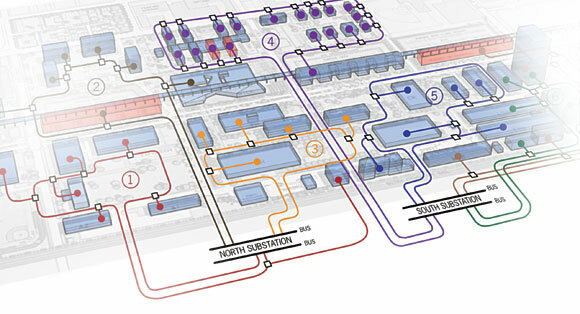 The high-reliability distribution system of the IIT Perfect Power System; each numbered loop represents a redundant system designed to increase the security and reliability of energy delivery. The greek philosopher Aristotle is credited with authoring the earliest definition of the word perfection, which he saw as being composed of three concepts: “That is perfect-which is complete, which contains all the requisite parts; which is so good that nothing of the kind could be better; and which has attained its purpose.” In disciplines from the aesthetics to ethics, how individuals define perfection ranges from being an approximate ideal to something so ambitious as to be unattainable. A group of energy visionaries comprising the Galvin Electricity Initiative (GEI) subscribe to Aristotle’s bold and decisive definition in regard to perfect power and their innovative plan to reinvent the nation’s electricity transmission, generation, and delivery network. Three years ago, GEI members and IIT faculty developed their idea to create a Perfect Power System on the university’s Main Campus. The group then elicited help from the United States Department of Energy (DOE), creating a three-faceted partnership between government, education, and industry to make the Perfect Power energy-distribution system the first of its kind in the country. The Perfect Power transformation will be completed in four phases over the next five years. Central to this conversion is a technology touchstone—a smart microgrid—that ultimately will be a model for revamping our nation’s antiquated and outage-ridden power grid. “Perfection—and let me define that as we have defined it for GEI—is that every consumer of electricity, large or small, can be absolutely assured of getting the quantity and quality of electricity that they need at the fairest price without any concern about it ever failing. That is, in our judgment, a very achievable goal,” said Kurt Yeager, GEI executive director, at a press conference announcing the launch of Perfect Power at IIT. The conference was held November 19, 2008, in Siegel Hall, the first building that will be reconfigured in the Perfect Power plan. At the conference, Yeager was joined by IIT President John Anderson; GEI founder and IIT University Regent Robert W. Galvin, former chair and CEO of Motorola, Inc.; representatives from project partners Commonwealth Edison (ComEd), Endurant Energy, and S&C Electric Company; and Shahidehpour. Perfect Power at IIT is one of nine projects that received DOE funding for smart grid research. In addition to the $7 million DOE grant, Perfect Power received $5 million in funding from the university. Galvin told conference attendees that he was inspired to form GEI after his wife, Mary, became one of the estimated 40 million Americans affected by a blackout that shut down cities in eight Northeastern states in the summer of 2003. During his tenure at Motorola, Galvin was instrumental in significantly improving quality standards through implementation of Six Sigma, a business philosophy that values defect prevention over defect detection. According to the GEI, the nation’s current electricity system accounts for at least $150 billion lost each year on power outages and interruptions. Smart grid technology could ramp up system reliability to 99.99 percent. The application of Six Sigma quality principles, coupled with the support of IIT’s electricity supplier, ComEd, in the goal of achieving a perfect system sets the university’s smart microgrid project apart from power conversions taking place at two other schools. After attending Six Sigma training courses, IIT team members established a basis for the microgrid by developing electricity system performance metrics based on consumers’ needs, applying error proofing to the IIT electricity system design, and developing cost-effective means to lessen failures and system shortcomings. 41 percent more outages affected 50,000 or more consumers in the second half of the 1990s than in the first half of the decade. If the grid were just 5 percent more efficient, the energy savings would equate to permanently eliminating the fuel and greenhouse gas emissions from 53 million cars. In 2000, the one-hour outage that affected the Chicago Board of Trade resulted in $20 trillion in delayed trades. IIT’s Main Campus averages three power failures each year at a cost of $500,000 annually in restoration expense, lost productivity, and ruined experiments. IIT is currently operating at capacity and in order to accommodate the increasing power requirements and digital demands, a new $5 million substation has been considered for the east side of campus to supplement two existing substations. Although Main Campus has the capability to generate essential power if there is a ComEd failure, its cogeneration plant is only cost effective at producing hot water, not the hot water, steam, and electricity it was originally meant to generate. The nation’s century-old electric grid, hailed by the National Academy of Engineering as “the most significant engineering achievement of the twentieth century,” is dominated by central generation through largely fossil fuel-driven power plants, which deliver electricity via a system of regional grids that are owned or run by utility companies. Its 300,000-mile network of transmission lines, subject to weather conditions and physically sagging under the burden of increased usage demands, crisscross the country on their way to delivering electricity to homes and businesses. According to the DOE, since 1982, growth in peak demand for electricity needs has exceeded the construction of new transmission lines by 25 percent. When an outage occurs, large populations of grid users can be left without power, sometimes for days at a time. Additionally, the centrally located design of the grid leaves it more vulnerable to terrorist attack. More numerous microgrids supplying power to cities and essential buildings would make such an attack far less widespread. While the IIT community can expect to see some physical changes in the campus landscape as Perfect Power unfolds, other modifications will occur at the cyber-level as the microgrid works to advance and integrate a powerhouse composed of three technologies: a high reliability distribution system (HRDS), smart metering, and renewable energy sourcing. Serving as the core of the smart microgrid, the fully automated HRDS will operate as an electrical feeder loop system that sequesters power faults and reroutes power flows, essentially functioning as a self-healing circuit. Vista® Underground Distribution Switchgear developed by S&C Electric will replace outdated manual switches and breakers, sensing electrical changes and shifting power without interrupting usage in IIT’s buildings. Distribution lines, visible above many neighborhoods in the Chicago area, are located underground on Main Campus. Each building and the cogeneration plant will be outfitted with an external, above-ground switch, protected from the elements in a watertight metal box, which will manage power throughout the underground lines. Another external unit—a master controller—will send information to the switches to ensure that the grid remains in an ideal mode of operation and also provide information to ComEd to help manage power during periods of peak usage or emergency situations, such as threatening weather. If a power outage occurs, a signal will be sent via a wireless connection from the controller to ComEd, making it easier for the utility to pinpoint the damaged circuitry. Research to enhance this automated distribution system is being led by Alex Flueck, ECE associate professor, coupled with research on fault detection in the buried distribution lines being led by Zuyi Li (Ph.D. EE ’02), ECE assistant professor. A second controller will work to increase energy efficiency by communicating with intelligent sensors attached to equipment such as water heaters; heating, ventilation, and air conditioning equipment; and lighting devices. On-off power switches will become a thing of the past, as the sensors will even determine whether a room is occupied and adjust the lights accordingly. Chi Zhou, ECE assistant professor, is working on these and other sensors that can be programmed to complete a task—be it washing laboratory glassware or completing an experiment—by a certain time, with the controller-sensor unit deciding the most efficient time to run. Siegel Hall will also be fitted with a smart meter that, like a standard electric meter, will indicate power is being used, but unlike a standard meter, will record usage in real time. This additional feature will enable IIT to determine the most cost-effective schedule for using power. Though the cost of electricity is currently fixed, using the new system, the university will have the choice to buy or generate and sell back power depending on the real-time price. At current power costs, avoiding peak-period usage will save the university at least 15 cents on each kilowatt-hour. Projections indicate that Perfect Power at IIT will effect a 15 percent reduction in overall demand and a 50 percent reduction in peak demand from ComEd. The smart meters will also measure the power generated by renewable energy sources, such as the solar panels being planned for the roof of Siegel Hall, which will be used to fuel a plug-in hybrid vehicle charging port set up next to the building. Hamid Arastoopour (M.S. GE ’75, Ph.D. ’78), Henry R. Linden Professor of Energy and director of the Wanger Institute for Sustainable Energy Research (WISER) at IIT, notes that the project is in line with WISER’s mission to advance the quality of life for all citizens. “As a WISER initiative, the Perfect Power system demonstrates the institute’s commitment to improving the energy efficiency and security of our nation,” he says. While eliminating costly power outages and reducing dependence on traditional energy sources are good enough reasons for the United States to take steps toward perfecting its present power system, there is another compelling reason: global leadership. Power Grid Corporation of India Limited, a state-run company established by the government in 1989 to create a unified power grid, has already maintained network availability for power transfer at 99.65 percent, which places it among the most efficient transmission utilities in the world. China’s target year for the unification of the country’s regional and provincial grid system is 2020. Plans include a possible link to Thailand’s power grid network, as well as to Russia’s grid. In the United States, President Barack Obama signed into effect the American Recovery and Reinvestment Act of 2009 on February 17 that includes $11 billion in credits and incentives for smart grids. In his “New Energy for America” plan, the president specifies investing in advanced smart grid technologies such as smart metering and distributed storage to help ensure that both energy use and costs will be significantly lower than they are now. That smart grid technology encourages user participation increases opportunities for consumers to actively partner with the government in the effort to increase the country’s energy efficiency. And on the South Side of Chicago, one town-like university campus will be leading the way for all Americans to count on having power that is, in essence, perfect.